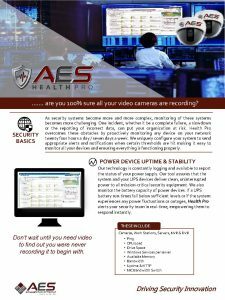 As security systems become more and more complex, monitoring of these systems becomes more challenging. One incident, whether it be a complete failure, a slowdown or the reporting of incorrect data, can put your organization at risk. Health Pro overcomes these obstacles by proactively monitoring any device on your network twenty four hours a day / seven days a week. We uniquely configure your system to send appropriate alerts and notifications when certain thresholds are hit making it easy to monitor all your devices and ensuring everything is functioning properly. …… are you 100% sure all your video cameras are recording ? Don’t wait until you need video to find out you were never recording it to begin with.